Patient support programs (PSPs) and market research programs (MRPs) are popular and, in some areas, expected services of the pharmaceutical industry that place a significant burden on pharmacovigilance (PV) resources. PSPs are designed to enhance patient safety and help patients and/or healthcare professionals to better manage disease and optimize treatment. They include post-authorization patient support and disease management programs, surveys of patients and healthcare providers, information gathering on patient compliance, and compensation/reimbursement programs. As the number of patients that access drugs through PSPs continues to grow, it is important for PV professionals to be able to work with and provide oversight of those programs. According to a Navitas Life Sciences survey carried out in May 2018, the average number of PSPs running in respondents’ companies at any given time was 100, with the average number of MRPs around 250. Each program could be responsible for generating tens of thousands of individual case safety reports (ICSRs), and, therefore, thousands of hours of work per month may be required to manage and monitor the PV obligations of PSPs/MRPs. It is important to note that even a small volume of cases could require hours of PV follow-up, because reports may contain less than ideal descriptions of a suspected adverse event (e.g., hospitalization) without sufficient context or supporting information. When asked what percentage of PSPs and MRPs contain vague terms, participant1 responses ranged from 5% to 90%, with an average of 55% for PSP ICSRs and 60% of MRP ICSRs. The complexity associated with PSPs and MRPs can place additional pressure on PV professionals. This complexity may relate to multiple distribution methods (such as hubs or specialty pharmacies [SPs]), or to rapidly increasing numbers of vendors involved in PSPs/MRPs. One member company began with three traditional SPs, two market research (MR) vendors and one distribution hub, with oversight of commercial vendors managed by many commercial colleagues but only one PV person. Just a year later, the same company had 26 MR vendors, 16 SPs, two data aggregators/contract administrators, and two hubs—but no additional PV headcount. This caused difficulty for that one PV person to maintain proper oversight of all vendors while attempting to keep up with commercial attrition and other PV obligations. Finally, PV needs that are not being taken into account, or not being considered early enough in the process can lead to possible errors or omissions in contracts and the data reported from initiatives, and the creation of additional work. When PV groups are directly involved in these programs, they can more easily work within the PSP environment. 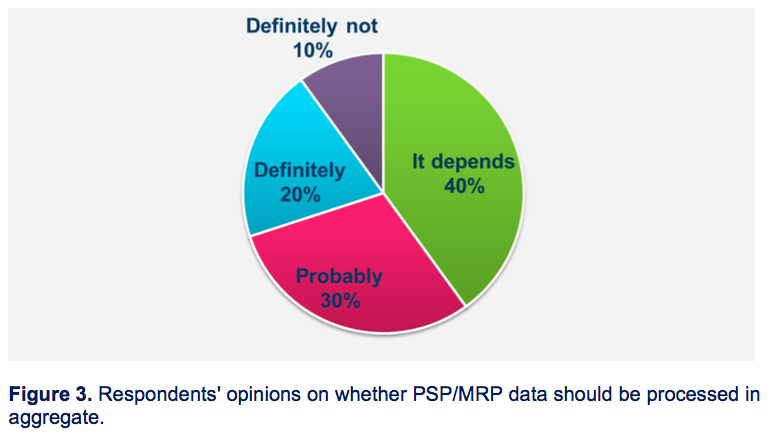 Survey results in Figure 2 below show that 40% of respondents reported that the current method of collecting PSP/MRP data was not useful for PV and that processing the data was expensive. 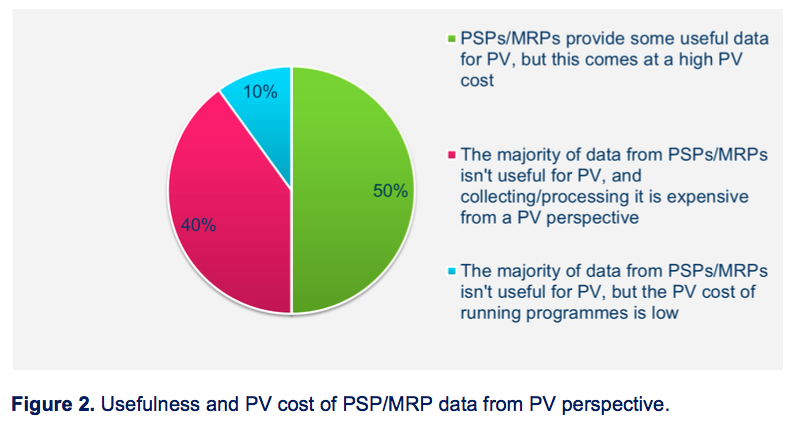 Half of all respondents saw some PV benefit from the PSP/MRP data but reported the cost of processing the data as ICSRs was too high to be sustainable in the long term. As shown in Figure 3 below, most survey respondents felt that the safety data received from PSPs/MRPs could potentially be processed in aggregate without loss of intrinsic value. Deeper discussions during working group meetings of the “it depends” category in particular revealed that the data received from MRPs may be best suited for this approach. As PSPs are likely to remain a prominent industry initiative, PV departments will continue to be challenged with additional resource demands and managing through the various complexities, including how to determine the value of the safety information collected relative to company efforts in the existing areas of surveillance and benefit/risk management. How can this be done? A variety of models are used by working group members to resource PSP/MRP-related work; the most frequently mentioned model involved this work being included as a formal, but not a sole, part of a person’s or group’s responsibilities. Setting company policy and global procedures for all PV obligations for PSPs and MRPs (e.g., program assessments, vendor qualification assessments, contracts, PV training, reconciliation, source data verification, material review, monitoring plans, etc.). Providing PV-related templates, tools, and training for all stakeholders involved in the design, implementation, management, oversight, and closeout of PSPs and MRPs. Providing global, area/regional, and local country support for PV-related PSP/MRP activities. A defined set of PV policies, procedures, best practices, and work standards for all PSPs and MRPs worldwide, with a common set of shared tools, processes, and systems. Single point of contact for obtaining executive awareness and support, at both tactical and strategic levels. The ability to assess the maturity of the overall PSP/MRP PV landscape against the best practices and work standards. Ability to quickly identify and adapt to changes in business priorities, market/regulatory dynamics, technologies, and stakeholder expectations. Direct and indirect guidance and support to assist stakeholders. Improved synergy and increased coordination between various organizational functions. Ensured alignment with the larger PV organization’s mission and vision. Not all member companies have the need or ability to set up CoEs—hence, the variety of resourcing models highlighted by our survey.2 While it is generally agreed that current resourcing methods are meeting the industry’s requirements, respondents agree that an increase in accountability beyond the PV department for the management and monitoring of PSPs/MRPs as well as making better use of available technology would help to make resourcing of these initiatives more sustainable from a future workload perspective. The optimal PSP/MRP resourcing model would vary from company to company and depends on the PV burden of PSP/MRP activity, as well as organizational capacity and understanding of the importance of correctly managing the PV obligations of these initiatives. PSPs and MRPs create a substantial and ever-increasing workload for PV professionals due to the volume of ICSRs they generate and the lack of quality of data included in these reports. Resource models of pharmaceutical companies are generally meeting the current requirements for PSP/MRP management, but the workload is large and ever-growing, so more sustainable solutions need to be explored. The CoE model, while not suitable for every situation, provides opportunities for centralizing, standardizing, and simplifying PV workload. Although opinions about the usefulness of data currently received from PSPs/MRPs for PV purposes varied, only 10% of survey respondents felt that data from these initiatives should definitely not be processed in aggregate. Hence, there may be an equitable case for processing MRP data and some types of PSP data (e.g., related to financial assistance programs) in aggregate. To lessen the negative impacts of PSPs and MRPs on PV departments, a proactive approach will be required. To increase communication and establish consistency across programs, PV could partner with legal teams by first providing basic PV training and then maintaining frequent contact. PV can also partner with commercial colleagues through face-to-face meetings and regular teleconferences with program leads. Safety contract language could be categorized, dependent on the level of risk that vendors have for contact with providers and patients. Additionally, electronic monitoring tools, maintained by all groups involved, could help track vendor compliance with adverse event (AE)-reporting timelines as well as track vendor type, contract status, and the need for inclusion/modification of AE language. Members of the PSP Management Working Group have discussed their experiences and insights on PSP/MRP value and resourcing and have agreed on the following recommendations. Standardize: Even the most basic definitions relating to PSPs/MRPs vary across pharmaceutical companies. Agreeing on standard terms and moving toward standardized collection methodology would simplify and expedite processes, reduce the number of reporting errors, and potentially allow for common safety training of PSP/MRP vendors across the industry. Collaborate: Early PV involvement in PSP/MRP design ensures adequate PV language in program contracts, appropriate review of materials to be used with program participants, and understanding of the PV impact of PSPs/MRPs by all involved. Furthermore, collaboration on the topic of PSPs/MRPs across companies allows common issues to be recognized, discussed, and addressed. Be selective: Not all programs are likely to require the same degree of PV obligation monitoring and scrutiny. Stratifying programs and understanding that add the most safety value can help PV departments focus monitoring efforts where it is most needed. Different programs can generate data of varying quality. It may be reasonable to collect data from some program types in aggregate—provided this approach is acceptable to regulators. Leverage new technologies: New technologies such as cognitive computing and predictive analytics can stratify PSP/MRP programs by value level, assess and process data, and determine the degree of human monitoring and review required. Simpler technologies, such as share spreadsheets, can be employed to assist in maintaining oversight of PSP/MRP programs. The members of the PSP Management Working Group are hopeful that the interest the European Medicines Agency (EMA) recently showed in the TransCelerate BioPharma study, looking at the impact of PSPs on overall PV operations, will help lead to practical changes in this area. The TransCelerate study, presented to the EMA in September 2018 (see “Study On Patient Support Program Impact Piques EMA's Interest,” The Pink Sheet, Oct., 15, 2018), helped confirm that companies should be able to take a risk-based approach and stratify collection of safety data from those PSPs that are more likely to produce useful and quality information. 1. Nine companies provided data for the survey (two pvconnect companies and seven pvnet companies). Results were then discussed at in-person and teleconference meetings open to all PSP Management Working Group members. pvnet companies are representatives of the top 30 pharmaceutical companies in terms of size/turnover, and tend to have annual ICSR volumes of 100,000 upwards, whereas pvconnect company ICSR volumes range from a few hundred to 40,000, corresponding to the smaller sizes of these companies (top 100 in terms of size/turnover). 2. A survey of PSP Management Working Group members was carried out in May 2018. The survey covered topics related to PSP value and resourcing and was carried out using Qualtrics software. The results of the survey were analyzed by Navitas Life Sciences and presented to the Working Group members for discussion at face-to-face meetings in June 2018 and teleconferences in July 2018.